A gritty New Zealand drama from director Paolo Rotondo exploring social inequality, race and the wealth divide, Orphans & Kingdoms has garnered strong reviews on the festival circuit in its home country. When a group of disaffected teenagers travel from the mainland to the relatively affluent climes of Waiheke Island, they pass the time committing petty crimes before breaking into the house of a wealthy businessman. When the man in question unexpectedly arrives home however, it doesn't take long for the situation to descend into anger and violence, the impoverished youngsters raging against the situation they find themselves in. The movie is also a family affair, giving it's scored by the director's cousin, Giovanni. A rising star of the international film score scene, Rotondo graduated from America's renowned Berklee College of Music before going on to lecture at the Italian National Film School from 2012 to 2015, where he absorbed influences from guest lecturers such as the esteemed Ennio Morricone. Indeed, upon listening to Rotondo's multi-faceted work for Italian TV (Il Guidice Meschino) and video games (point and click fantasy role player Thunderbird), it's not hard to hear Morricone's elegaic influence coming through. Rotondo has also established a name for himself outside of his home country, having orchestrated Patrick Cassidy's sweeping score for acclaimed black comedy Calvary (another work in which Morricone's influence is apparent). When it came to scoring Orphans & Kingdoms, Rotondo had a vivid taste of the complexities of feature film scoring when the entire movie was re-edited following a test screening, prompting him to not only re-score the entire movie but also come up with two completely new bits of material. Nevertheless, regardless of the challenges inherent in its creation, the Orphans and Kingdoms score is an intriguing and accomplished piece of work, mirroring the film's narrative and conjuring a tapestry of hope and despair. The score begins with the arrestingly elegaic "Alone" featuring an intricate guitar solo and haunting boy vocal; it immediately sets the tone for what is to follow. This musical dichotomy, a battle between light and dark textures, runs throughout the remainder of the soundtrack. "Scotty" features tantalising glimpses of a haunting piano solo as well as more ethereal vocal work but it's short-lived, high-end, sustained strings playing for the remainder of the track behind a melancholy guitar accompaniment. "Sweet", as its title suggests, utilises the guitar in a somewhat more positive and upbeat vein, breathy vocals lending an air of mysticism that complements the main melody very effectively. The piano theme appears again at the very start of "Worries": a graceful and elegant piece, it soon attains the kind of intricately florid nature of which Alexandre Desplat would be proud to call his own. Needless to say it doesn't take long before the shrill string backing nudges the music into darker territory once again. "Bad Kids" is perhaps the biggest surprise of the entire score, grungy modernistic textures juxtaposed with a sweeping string/choral energy to create a fusion that's quite captivating. If any track sums up the score's wider ethos, and indeed the narrative of the movie as a whole, this would seem to be it. The piano returns in the more classically oriented "Father & Daughter" before "Dreams" and "The House" usher in the score's darkest moments, uneasy strings and unsettling vocal effects creating a vividly striking portait of desperation and alienation. Both "Drugs" and "Danger" build more tension through percolating strings and percussion before "Goodnight" finally appears to lead the listener towards some sort of redemption, the grittier textures dropped entirely in favour of the guitar. The finale, "Kingdoms & Orphans", then expertly brings all of the score's disparate elements together, strings, guitars, electronics and vocals, for a satisfying close. 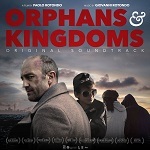 Although for the most part Orphans & Kingdoms is a somewhat dark and pensive score (in-keeping with the nature of the movie's narrative, as is any effective soundtrack's aim), Giovanni Rotondo does an effective job in juggling several, seemingly conflicting, textures and bringing them all together. Showcasing the influence of his great mentor, Ennio Morricone, as well as his own uniquely contemporary voice, Rotondo has crafted a challenging yet compelling score that makes one hopeful for the next generation of film composers ascending the ranks. The album is available at iTunes, Google Play and Loudr.fm. There is more about the movie on the official website OrphansandKingdoms.com, and more about the composer can be found on his website GRotondo.com.